No snow for Christmas this year, just a mild winter garden glistening with hoar frost on cold mornings. Hoar frost is a staple of mild winter gardens and I’ve always wondered about it. Defined as “a grayish-white crystalline deposit of frozen water vapor formed in clear still weather on vegetation, fences…” it looks like icing on the grass. It sparkles before it evaporates, especially as the sun is rising. One of those glassy mild winter garden mornings was captured perfectly in Wye Valley, near the border between England and Wales on the grounds of a 16th century manor house. 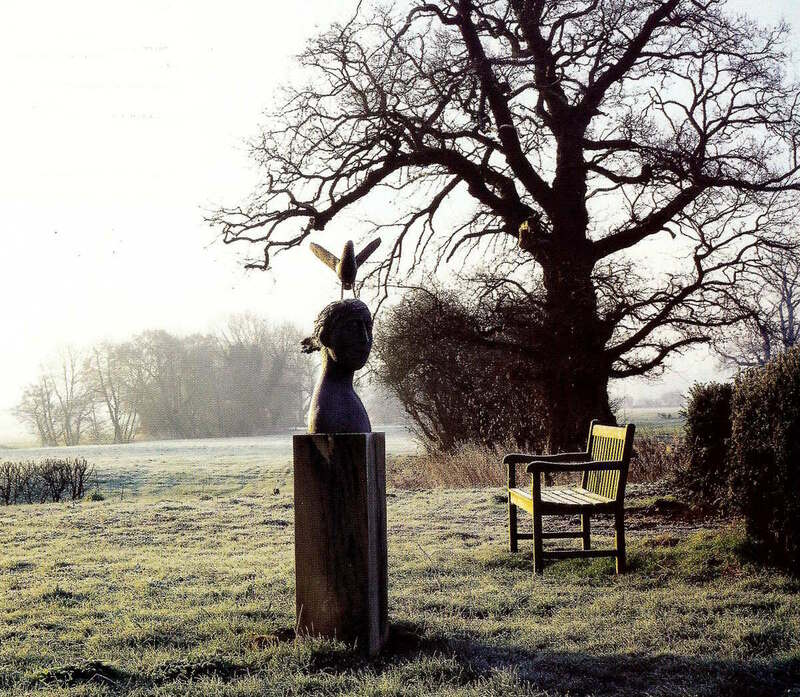 The six acre estate, current used as an artist’s retreat, features a kitchen garden, streams, hedges vistas and two surprising contemporary sculptures. These views express this year’s mild winter landscape with its deep black greens, strong shadows and bare trees. 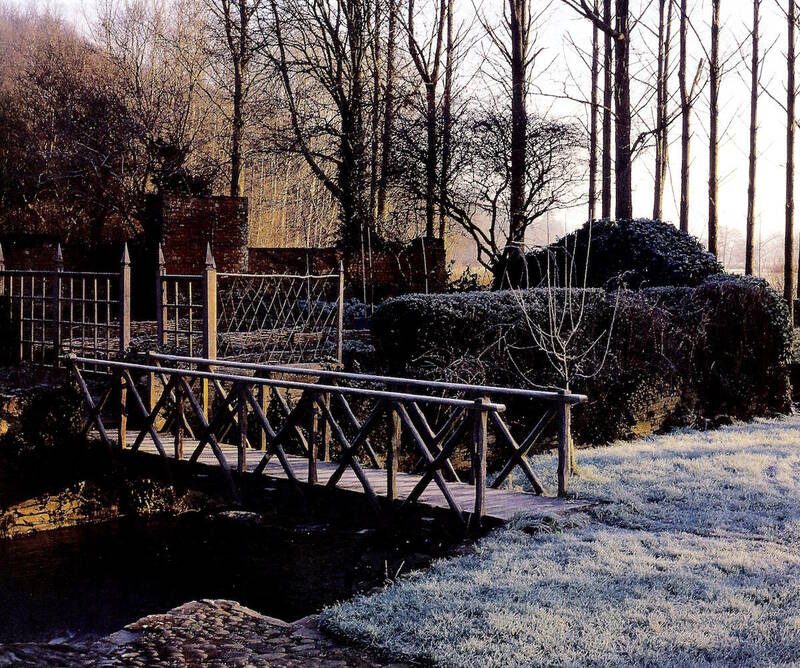 An oak bridge [top], with rustic crossbuck supports for the railing, leads across a narrow end of the stream to the kitchen garden. One side is bordered by a brick wall, another with shaped hedging and the walkway on the edge of the potager is screened off by wooden trellis — ample eye appeal during the months when hoar frost makes the lawn appear white and nothing new is growing. One of the most romantic areas on the estate is named the Pale Moon Garden after a historical mistress of the house described by her husband as “a pale moon dispensing bountiful gifts…” With large stepping stones across the lily pond, it can be seen across or from the center. 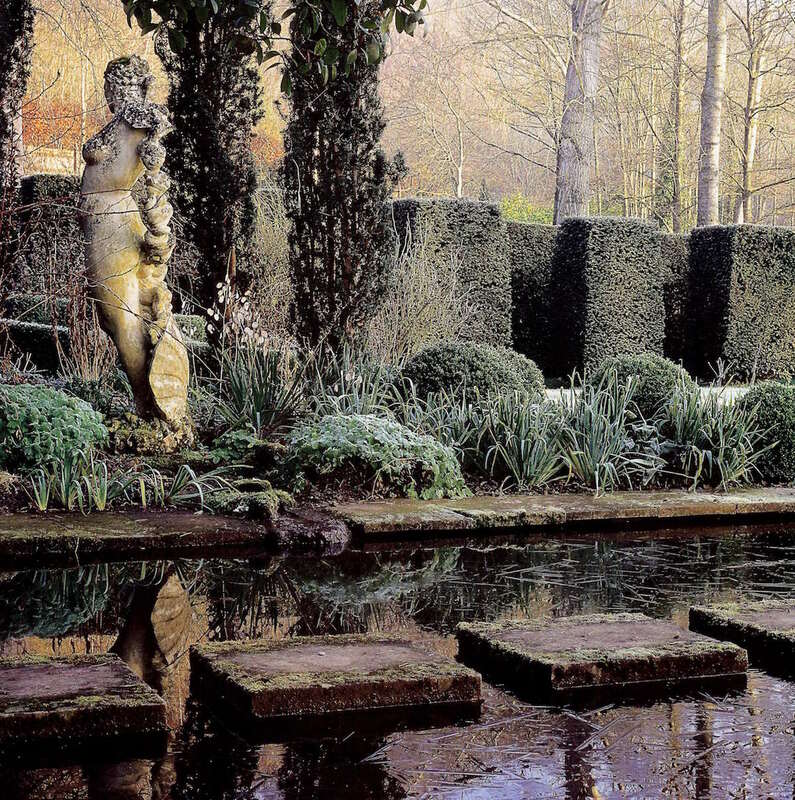 Rows of staggered rectangular shaped hedges act as a screen that also sets off a contemporary statue by Simon Verity, the 70-year old Brit known for his garden sculpture but who also has worked on the Cathedral of St. John the Divine in New York. Open vistas and gnarled old oaks punctuate a meadow with gorgeous views. Another contemporary sculpture — this one by the whimsical sculptor Christopher Marvell — shows how each successive generation of owners adds to a garden and how many years it can take for exterior landscapes to be completed (if they ever are!). 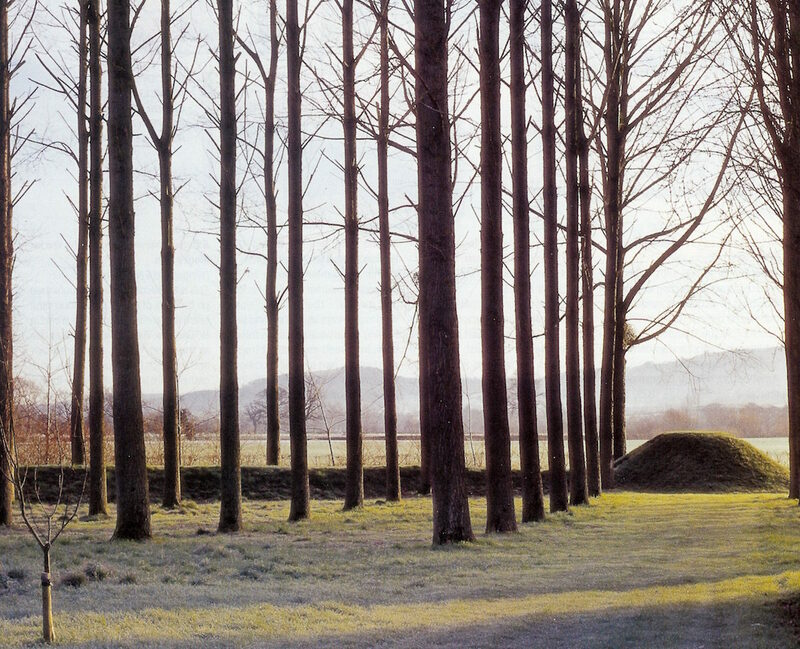 I’m obsessed with geometric plantings, I admit, even something as simple as rows of yew trees. While they appear architectural with hoar frost on the ground, during the summer they provide shady lanes which must be equally elegant and more sheltering. As my final post of the year, I hope everyone will find this garden as nurturing as I do and consider it an expression of my hope that all of us will continue to be inspired by natural beauty in the coming year.